Ever since Deadpool's post-credits scene made it clear that Cable would be showing up in Deadpool 2, there has been no shortage of actors expressing interest in playing the time-travelling mutant. 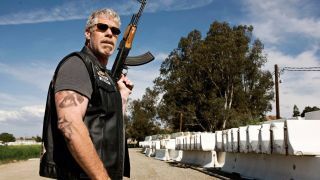 The latest to throw his hat in the ring is Hellboy star Ron Perlman, who took to Instagram to make a case for why he'd be perfect for the role. Or hair. I'm the only one with #Cable's friggin HAIR! If we're talking about looks alone, Perlman's spiky white hair would make him a shoo-in for Cable. The actor is no stranger to comic book movies either; in addition to Hellboy, Perlman also starred in the excellent Blade II and has had numerous voice roles in DC's animated cartoons. When you add that to his considerable geek cred, Perlman is more than a viable candidate for Cable. Here's hoping Tim Miller feels the same way.